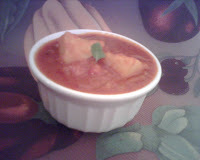 Today I want to share one of my favorite recpies, Tomato-Aloo curry. I cook it very often, and this is my hubby's fav too.I know this is a regular curry we can find in my house holds of South India. 7. Ginger-Garlic paste 1 1/2 tsp. 1. Heat oil and add chopped onion, let it fry till translucent. 2. Add ginger-garlic paste and fry for another 1 min, then add turmeric pwd followed by potato cubes, fry them for a while. 3. 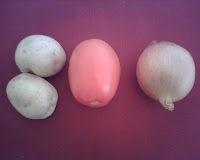 Add chopped tomatoes with coriander leaves and salt. 4. Put the lid and make the stove in between to simmer and medium flame. 5. Check it after 5 mins and see if the potato cubes are cooked ,then open the lid and cook for few more mins, then its done. 6. Can be served with rice or roti. Kitchen Notes: All quantites are approx., changes should be made according to the taste. First time visit your blog but I am too late to know so many things. I miss it so many things. You are great post with great pictures. My grandmother is made Ginger brittle but I do not remember its name we call it something different. Yes, I really very happy to see this recipe. After 15-years I remember this dish. Also I read your meme. I like it and also share with you is “Three things I hate”.